“Announcing the 2nd Rice-Husk-Bag Workshop! This will take place in northern Thailand, November 2015. We will learn how to build walls with bags filled with rice husks (hulls), benches with earthbags, put in doors and windows, cover the walls with a mud, sand and rice husk plaster, and add decorative bottle designs. 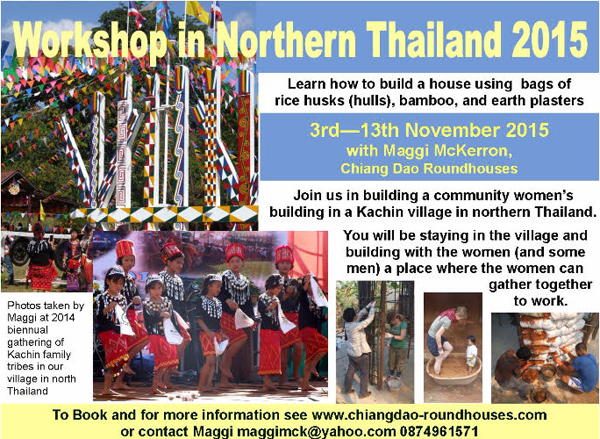 Our building will be a work space for a women’s group in a village in Northern Thailand. These women are political refugees from Burma, who have been given land here in Northern Thailand. They are an ethnic minority group called the Kachin. Search our Natural Building Blog for lots of previous blog posts about rice hull bag houses.